Sea contains different varieties of living creatures in water, Octopus is one of it. These cannot live in pure water and can live only in salt water. That is why we cannot find these in rivers. Shape of Octopus body is very abnormal. The upper part of the body contains Head, Stomach, Mouth and relating to this lower part contains eight long organs that look like arms spreading to all sides. By using these long arms (tentacles) it will catch the food and put it in its mouth. The arms of an octopus have two rows of suckers, extending their entire length. 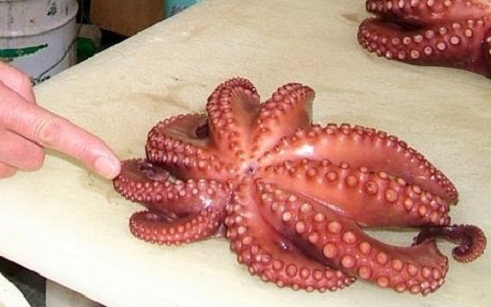 Suckers help octopus to taste the food even by hands. Based on the type of octopus, the length of arms varies from some inches to some feet. In Octopus, the largest one is the Giant Pacific Octopus. This octopus can be found in British Columbia region. It is approximately 300kgs weight and each tentacle is of 33 feet long. If Octopus finds any danger from the enemies it will spray some kind of liquid on it and escapes from there temporarily. Suppose if any enemy catches octopus arm, as lizard cuts it tail on its own similarly octopus escapes from there by cutting its arm. After 7 to 8 weeks new arm will come in the previous place. Head like part is having stomach and there are three hearts for octopus and this is another specialty of octopus.